While many balloon mappers use rubber or latex balloons, we've found that they deflate after only a few hours, and cannot be used more than a few times before becoming too worn and delicate. We're experimenting with Mylar (boPET film) and EVOH (Ethylene Vinyl Alcohol) with now because they are gas barriers, unlike Polyethylene (HDPE/LDPE/LLDPE) -- meaning that, once inflated, such balloons can stay inflated for days or even weeks. Like polyethylene, EVOH can be heat-seamed with a soldering iron or plastic bag sealer. Mylar must be glued. Mylar should be glued with UHU Power Stic in lap joints according to forum discussion on RC Groups. UHU Power Stic doesn't appear to be for sale in the USA, but can be found on Ebay UK. A successful flight mapping based on a collaborative design from January 2011 at the Gowanus. Notes from flight? This kite was lost, pulled off its line by wind. Questions: is this the appropriate balance of active and passive lift? Another one in Peru. 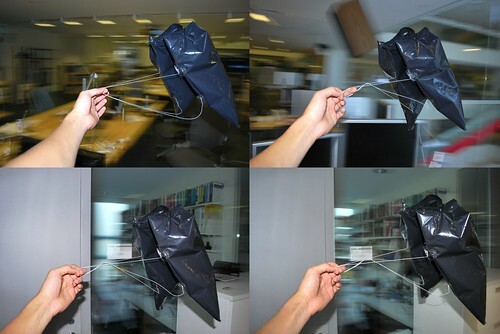 This kite-balloon needed a second mylar sleeping bag to lift the camera, ruining the aerodynamics. The horizontal sleeping bag doesn't work well. The Black Knight, by Jeffrey Warren, Oliver Yeh, and Reid Beels, April 2010 This kite had structural problems in its construction and broke quickly. 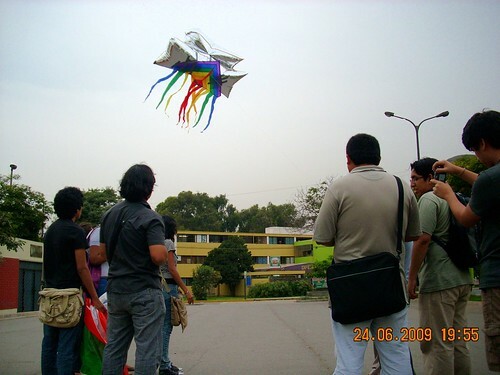 It is an attempt at a helium sled kite. Other problems: material- it was made from polyethylene, which is not a gas barrier. Otherwise, a fine early flight and prototype. 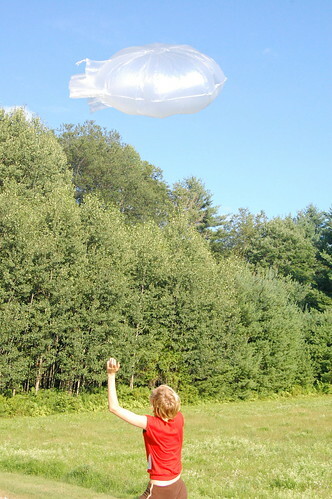 A blimp-style kite balloon from Grassroots Mapping's NuVu Studio workshop April, 2010: This balloon was also lost, owing to a knot. 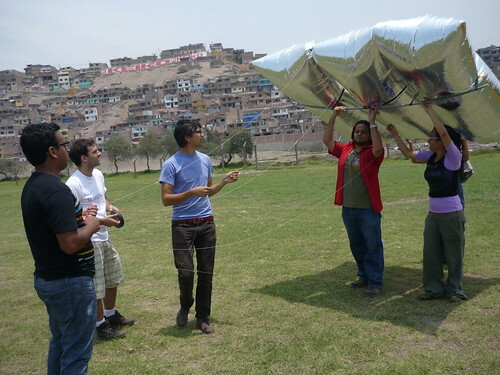 Problems: Balloon does not hold its shape in pressure due to dispersion and lack of rigid structures. Material is polyethylene, which does not retain helium well. 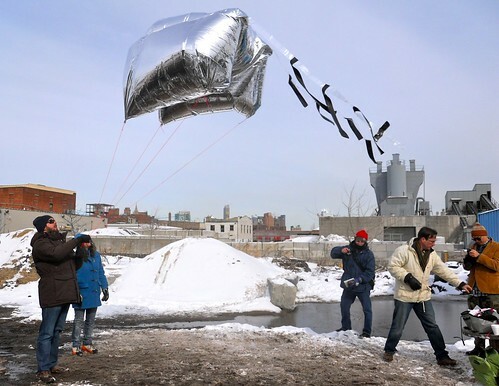 (/place/new-york-city) Mathew Lippincott-I built several kite balloon models in July of 2008. I didn't have a digital camera at the time, so I don't have many flight photos. 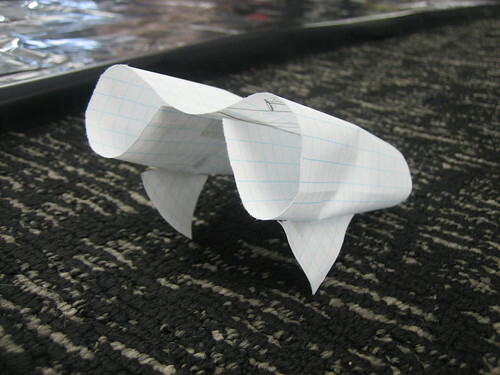 My conclusion was I needed to learn more about plastic and seaming before attempting to fly one of these designs. 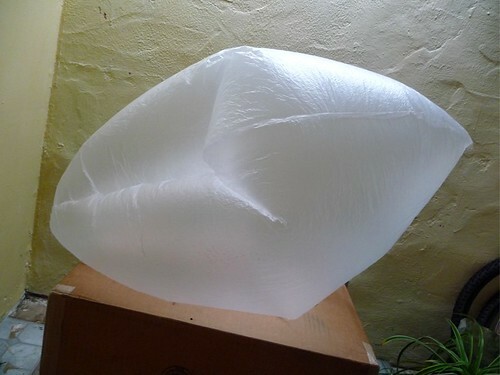 This ribbed balloon with internal supports seemed to fly reasonably in medium winds when inflated with air and with a tissue paper tail attached. The internal supports were taped and the envelope heat seamed, but small tears developed around the internal supports during flight. Built from .315mil HDPE. Earlier, I'd built a lenticular kite balloon with inflatable fins. This was before I'd found the Helikite design, whose rigid structure is far superior. I taped it together. oops! full of holes. Sled Kites Sled kites with balloon re-enforcements on the sides inspired Jeffery and Leif's designs. They have a high active lift (wing lift) to static lift (gas lift) ratio. Helium here is a means of lifting a kite into higher winds at higher altitude. More ram/sled kites here. 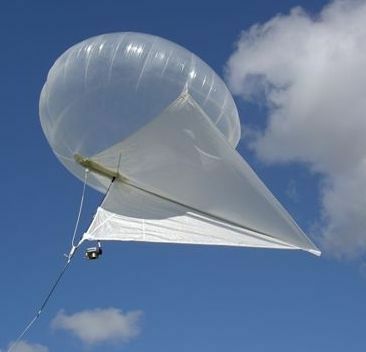 This technology was invented by Domina Jalbert, who also experimented with kite balloons in the 1940's, and later invented the rammed air air foil. 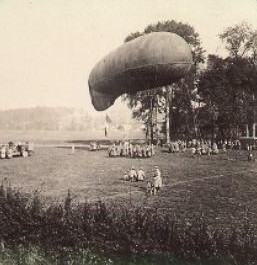 Ram-air structures also appear on the early Parseval-Sigsfeld balloon. Lifting Bodies Lifting bodies are high-volume shapes that produce active lift like wings do. They would be good compromise shapes for a kite balloon, allowing a high volume of lifting gas and aerodynamic stability Examples of kites using lifting bodies can be seen in lenticular kite balloon designs, like the commercial Southern Balloon Works Kingfisher and Allsopp Helikite. Bowed Kites Traditional Asian bowed kites are very stable. They are also curved like the underside of a balloon. Features of Bowed kites can be seen in the Allsopp Helikite, detailed below under "Alternatives to the blimp shape." construction and commercial manufacturing Mathew- I went to my local party store and looked for construction methods amenable to a kite balloon design. This turtle was the only balloon I found with a pattern of more than two gores (it has three. 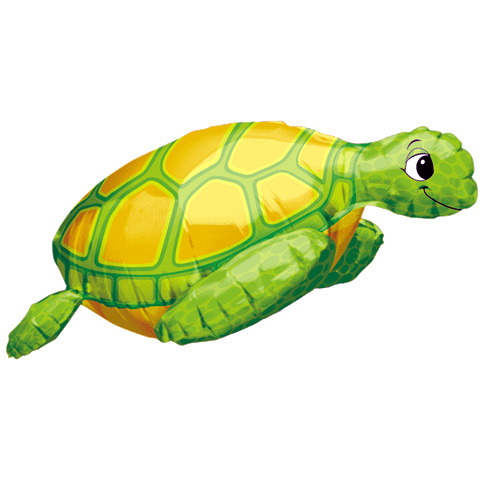 The turtle's main body is less wrinkled than circular party balloons, has a high volume for its size, and a flat bottom that looks like it could kite. it will probably be cheap to mass produce: it is made in a single motion out of a folded sheet of plastic, as detailed in this endearing 1927 patent for a more realistic inflatable elephant. I flew it as a kite, giving it two tails. I couldn't get the balloon to balance right owing to the weight of the head and flippers, so and the tool balloon nose dives in the wind. A larger balloon with more helium would allow more thorough testing. Early kite balloons were used for artillery observation, and had to be manned. 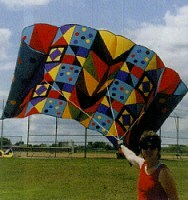 Large balloons have different design constraints, but similar functions to small kite balloons. From discussions with users of contemporary small kite balloons, it appears that these cigar, sausage, or "blimp" style balloons (sometimes called photoblimps) aren't particularly stable below 15ft long. That said, early designs show the basics of kite balloon structure, strategies to maintain rigidity, and rigging concepts that we can probably learn from. 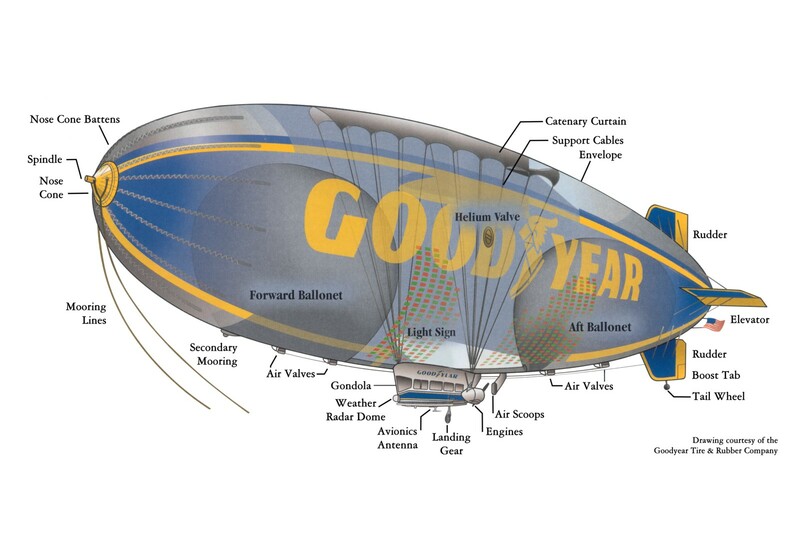 In terms of shapes to pursue in development, see "Alternatives to the blimp shape" below and "Inspirations" above. Parseval-Sigsfeld style balloons first saw battle during the Russo-Japanese War (1903-1905), and were notably well integrated with mobile artillery by the Belgians during 1914's German invasion. 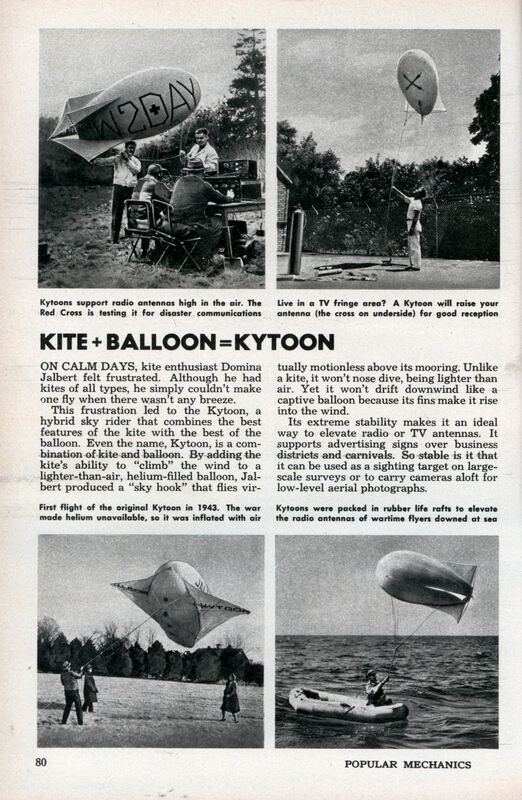 Amateur Radio Operators began looking for a good way to put up antennas, renewing interest in kite balloon development. 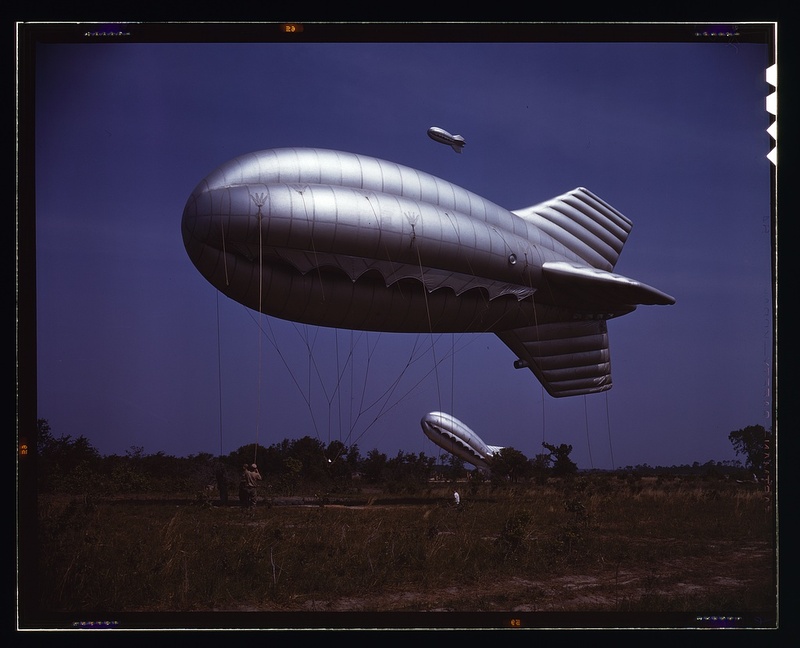 Domina Jalbert Patented a kite balloon in the mid-1940's, and his design is similar to the "blimp" style Caquot balloons. His patent describes the design rather well. 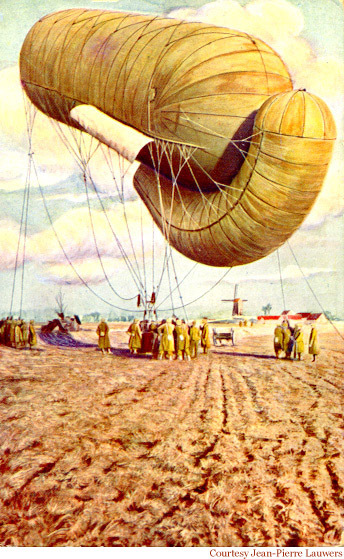 Jalbert used pressure and rigid structures only to maintain his kite balloon's shape, rather than rammed air ducting. All the small kite balloons I've seen do the same. 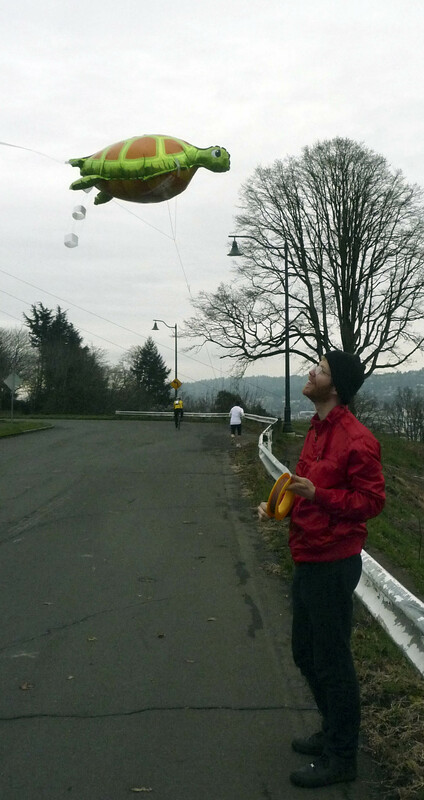 Recently, lenticular (lens-shaped) kite balloons have emerged. From discussions with users of "photo blimps", I (mathew) have heard that at below 10-15 feet long the design is not particularly stable. 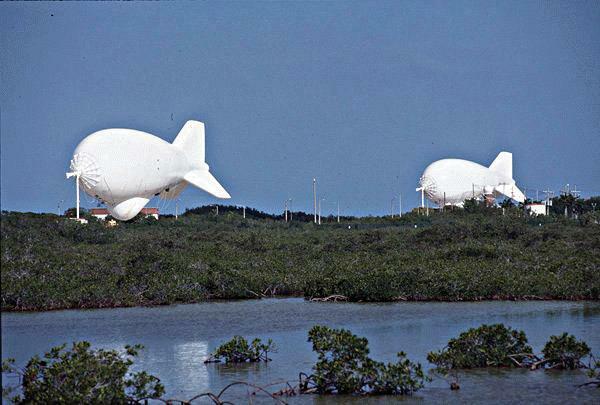 The lenticular shape appears to be more stable, and it aught to be more space-efficient, having a higher volume than the blimp shape. Lenticular objects are a form of lifting body (see "Inspirations" below) and may perform as active (wing-like) lift structures.